Never thought to put those two together, but perhaps that is why I’m not in marketing. 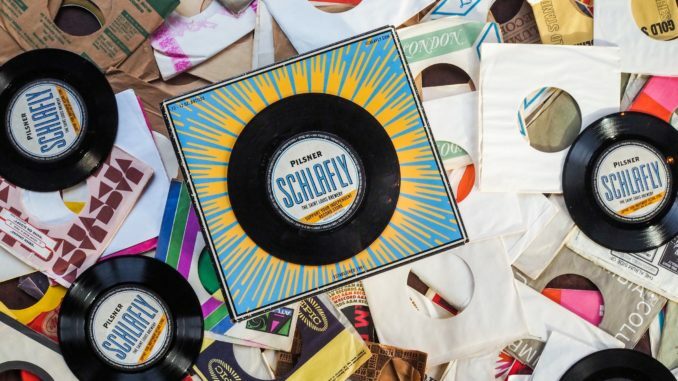 But leave it the brains at Schlafly Beer to come up with a way to bring the retro cultural revival of vinyl to beer, in the form of a new promotion for a limited edition version of its Pilsner pack. The Pilsner pack made it’s return to the market back in August and thanks to all of us, the sessionable style is now part of the brewery’s 2018 portfolio. Today, the brewery announced that for a limited time, the 12-bottle pack of the golden, crisp lager will come with a record affixed to the front which will feature a voucher inside for $5 off of any vinyl at local participating record stores across Schlafly’s distribution. The special record packs will be available now through spring. This pilsner is made using Magnum and Tettnang hops from Germany giving the beer both floral notes and a definitive earthiness. “The Lublin hop, traditionally used in lagers, rounds out the medium-bodied malt character, and the noble Hallertau lends a hint of spice,” said Hale. Here’s a list of where you can pick up your vinyl if you’re inclined.